Chiyomi looked stunning in her beautiful wedding dress as she and Kaz Ogawa said their nuptials in the shadow of the majestic Sierra Nevada mountains on March 26, 1944. Like so many other young Americans who would take part in launching the start of the “baby boom” that followed World War II, the Ogawas had found love and were ready to settle down. What should have been one of the happiest days of their lives must have been dampened by the barbed wire that surrounded their wedding location. 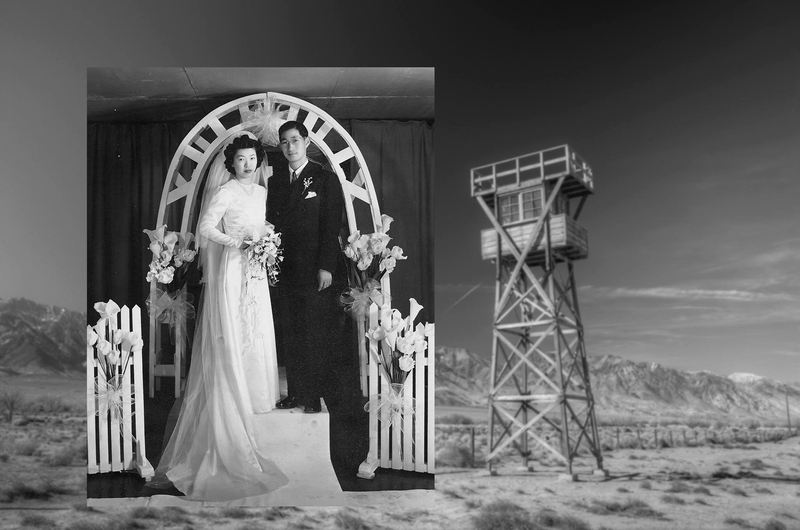 They were married while at Manzanar, one of 10 “war relocation centers” established under Executive Order 9066 to house American citizens of Japanese descent and Japanese immigrants who lived along the Pacific Coast. Chiyomi’s Auntie Nui, a professional seamstress, designed and made the wedding dress for the bride’s special day. They sent away for the material to Montgomery Ward, her flowers were silk and Chiyomi borrowed the veil. After the war ended and Japanese Americans worked to reclaim and rebuild their lives, Chiyomi’s wedding dress was eventually worn by five other women on their special days. This garment weaved a common thread through the lives of Chickie Hino, Hara Fujihara, Hasie Ogawa, Kay Fujikawa and Nattie Koyama. Just like Chiyomi, all of them made their homes and raised their families in Pasadena. Chiyomi never imagined that her wedding dress would inspire interest 70 years after she said “I do,” nor did she ever fathom the photo of her and Kaz would generate such intrigue as a unique record of American history. 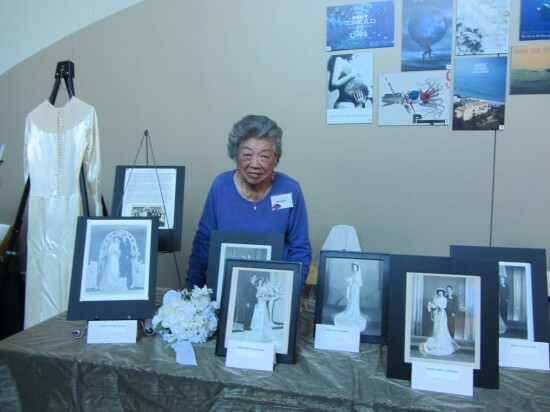 This photo along with some of the other brides who wore the dress photos were captured by legendary photographer Toyo Miyatake, who was also incarcerated at Manzanar. Committed to continuing his craft, he smuggled a lens into the camp and build a camera using a wooden box. His photos provide some of the few first-person perspectives of life inside Manzanar. 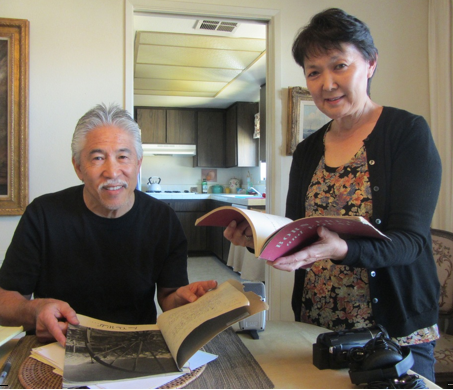 Some of his work from this experience is documented in a book produced in collaboration with Ansel Adams, “Two Views of Manzanar.” After the war, Miyatake was the wedding photographer for brides Fujihara and Hino. Chiyomi Ogawa will be at the White Satin Wedding Show to tell her story and those of the other five brides. In addition to the dress that started it all, visitors can see Steve Nagano’s eight-minute film about the dress at 11:30 a.m.
Those who come to registration and sign in as guests of Chiyomi will receive complimentary passes. Free parking at Gate 5. The wedding dress (accompanied by Chiyomi Ogawa) was on exhibit at the Aquarium of the Pacific Autumn Festival in Long Beach in 2012 and 2013. The passion of creating the White Satin Wedding Show is to redefine a wedding show by engaging an interactive experience as well as to bring thought into the art of marriage. Experience an intimate, edgy, interactive event that includes all the components of a traditional wedding show, with an additional twist of creativity. Up-and-coming gown designer Dory of Marshmallow Couture presents her 2015 fashions and a pioneer for women in horseracing, jockey Joy Scott, models. There will be a discussion and demonstration of the use of drones to capture weddings by filmmaker Adrian Zaw of Aerial Videography. The Man Cave Lounge will feature activities and presentations for grooms and groomsmen sponsored by PartyWorks Interactive with Drone Videography, D.J. Carmin Wong, Title Boxing Club and more. Keynote speaker Tobey Dodge takes you through the planning of three unique weddings. She will also be available for one-on-one moments with brides and grooms. Structural welder Susanne LaBrake creates custom and lasting bridal boutiques forged of steel. For more information, visit www.WhiteSatinWeddingShow.com.